The image of this mother with young daughters fleeing teargas launched by the US Border Patrol brought the humanity to the US-Mexico border when it went viral. More and more these days I wonder what difference it would make if each of us in the US could see firsthand the human face of immigration—without media lenses, without political agendas, without ideological spins—simply eye-to-eye. Last month while replenishing Humane Borders water tanks along remote desert roads, several of us humanitarian aid workers encountered Luis, a young man who had mired his 4-wheel drive pickup in an arroyo near a dilapidated windmill. After freeing the vehicle we talked with Luis about the risks of traveling solo in the desert. I asked, “Why are you out here alone anyway?” He replied that he was looking for his father who left Mexico for Phoenix on foot weeks ago and had not shown up. In his father’s last phone call 10 days earlier, he said that he was alone near an old windmill and nearly out of water. All this young man, an only son, wanted was to bring his dad back home to Phoenix where he had resided for decades. So he drove on and off road, in a place he had never been before, hoping against hope to find his father. Last week I accompanied several members of the Tucson-based humanitarian aid organization Samaritans to a rugged mountainside 30 miles north of the US-Mexico border, where the desiccated remains of 25-year-old Jesús Lopez Villa were found last October. He too was simply trying to get home to his mother. At her request we planted a cross at the site of his death. These stories are innumerable, and growing. 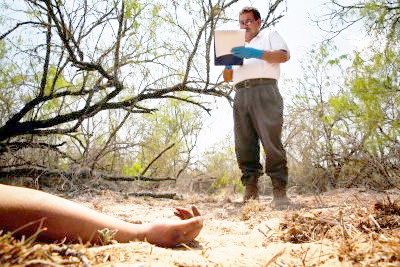 The Pima County coroner’s office reported that another 122 bodies were recovered in the Tucson sector of the border between Sept. 2017 and Sept. 30, 2018. Each story is uniquely tragic. The accumulated weight becomes unbearable. The numbers begin to blur and numb my senses. After all, thousands have died. And yet, what are families to do? We are hard driven, or better said, heart driven, to be together. What can we as witnesses and allies do? The landscape around our borderland communities is an expanding graveyard. There is no end in sight. The US-Mexico borderlands region has been characterized by government and mainstream media as dangerous terrain, overrun by criminals and otherwise non-desirables. Our face-to-face reality on the ground tells a markedly different story. On Sept. 21, the city of Ajo, AZ celebrated the International Day of Peace with a lively parade and communal gathering in the town plaza. The holiday was established in 1981 by a unanimous decision of the United Nations “to commit to Peace above cultural differences and to contribute to building a culture of Peace.” The Sierra Club reported that Ajo was the only community in North America known to have a tri-national event. People from Mexico, the Tohono O’odham Nation, and the US came together. The circle of local residents and visitors at the No More Deaths’ monthly memorial vigil in the plaza is widening. In song, silence, and story we commemorate the lives of those who perished while crossing the desert around Ajo. A community aid center is now opening here. This office will offer information to local residents on their legal rights and hands-on ways to respond to the humanitarian crisis we are witnessing. People in the borderlands are finding deeper ethical and practical traction to provide humanitarian relief in the face of formidable odds including federal government efforts to criminalise such aid. As I write these lines, the first wave of US troops has just arrived in Ajo. We are told that hundreds more will follow. Ironically an invasion is coming from the north, not from the South as anti-immigrant rhetoric had predicted. Out-of-state bands of armed vigilantes too have escalated their anti-immigrant activity along the Arizona-Mexico border. We are under siege by men with guns. A Border Patrol spokesperson said at a recent community meeting that the arrival of the army will be “good for our local economy.” Haven’t we heard that line before? What a ludicrous mismatch: An army and militia vs. asylum seekers. Fear faces off with hope. Is our national security at risk? What is really at risk? Immigration has a human face, as does fear. No army can stop, nor wall protect us from our fears, anymore than we can derail the hope in the face of others who like many of our ancestors sought refuge on this hallowed land. As Anne Braden wrote, “Perhaps no one living today will see a major change. But it will come.” I believe it already is. —John Heid works with the group No More Deaths and Humane Borders in Ajo, Arizona. The chambers of the Evo A. DeConcini US District Courthouse in Tucson Arizona have borne witness to innumerable immigration-related trials—for decades. Each day’s court docket is posted prominently on a large screen near the grand entrance, just beyond the metal detectors. Most of the case names are Latino/a. Those individuals slated for a separate so-called “Streamline Court,” which criminalizes, incarcerates, and then deports hundreds of people weekly, are not listed. This federal courthouse is a deportation mill. The past month, however, courtroom visitors to DeConcini witnessed two different types of immigration related cases. These offer a wider lens into status of law, justice and conscience in the US-Mexico borderlands. In October 2012, US Border Patrol agent Lonnie Swartz fired 10 bullets through the international border fence into the back of José Antonio Elena Rodríguez, a 16 year old, who was walking down a city street in Nogales, in the Mexican state of Sonora. On April 23 this year, Agent Swartz was found not guilty of 2nd degree murder. Weeks later, Scott Warren, a humanitarian aid volunteer from Ajo, Arizona was in the same federal courthouse facing two counts of “harboring” and one of conspiracy to transport/harbor, all felonies, for providing food, water and clothing to two men who turned up in Ajo weary, hungry and cold after walking several days and nights in the desert. Mr. Warren is looking at 20 years in prison. His guests were deported. One courthouse, two faces of justice. Murder gets a pass and compassion goes on trial. The juxtaposition of these cases lays bare the dissonance of law in the borderlands. The cross-examination by the federal prosecutors exposed a wide, familiar crevasse in ideology: conscience vs. the law. After Mr. Warren’s moving spiritual testimony, the barrage of vapid “yes” or “no” questions from prosecutors rattled off the courtroom walls like ball bearings in a tin pan. Unable to refute Mr. Warren’s soul sharing, the prosecutors took aim with a “Why didn’t you just call 911?” form of rebuttal. Justice was reduced to the level of television game show banality. Trials, for me, are a litmus test of the health or illness of society. This particular courthouse is rife with examples of the later. Scott Warren’s testimony is a cry in the wilderness, a breath of fresh air in the belly of the proverbial beast. As his testimony echoed off the chamber walls I couldn’t help but ponder what else these walls have absorbed, sounds that a court recorder will never write, nor a transcript ever reveal: The chain gang shuffle of shackled men and women marched in and out of Streamline Court. The deafening silence when the jury foreperson announced that Agent Lonnie Swartz was “not guilty” of the murder of José Antonio Elena Rodríguez—not to mention the gasps and sobs that followed. Walls hold stories in stone. What happens in court echoes off these walls, and across the country and the hemisphere. These are the unseen border walls. Here the fist of US immigration policy is hidden in a silk glove. What can bring down these walls and the ideologies that prop them up? When will the weight of injustice be too much for them to bear? There is plenty more in store for the Evo. A. DeConcini Courthouse this year. Magistrate Judge Bernardo Velasco will rule on Scott Warren’s motion for dismissal in late June. Meanwhile, eight humanitarian aid workers, including Mr. Warren, await prosecution for the crime of placing water, food, and other life-saving supplies on public lands where high numbers of human remains have been recovered. What will the vaunted walls of DeConcini hear next? For years I have felt an edgy tug, like a rip tide, drawing me closer to La Frontera, the US-Mexico border and its wall, the great divide. Last June I finally gave in. I packed my books and sourdough starter and headed two and a half hours west of Tucson to a copper mining community-gone-bust, Ajo, Arizona. It is quintessential small town America, southwestern style. Ajo has one zip code, one stop light, one grocery store, three gas stations, and three coffee shops. Add to that a mechanic’s garage, two hardware stores, a library, and three private clubs. There is no Walmart, no McDonald’s, no local police department, no hospital, and never a traffic jam except on winter weekends when tourists travel main street—headed to the beaches of the Sea of Cortez, an hour and a half south. Javelinas, also known as Collared Peccary or skunk pig, roam the streets at night, and coyotes stroll the sidewalks by day. We can see the Milky Way from the historic, palm tree-lined plaza, downtown. Yes, there is little light pollution and few clouds here. At a glance this town looks like a Norman Rockwell print: idyllic. The postcards at the local gift shop, like the Ajo Red Raider High School yearbook, show our best side. Yet Ajo has another side, a shadow side. It is the shadow of the Wall. Ajo is just 39 miles from the border with Mexico. Thus, well within the 100-mile perimeter of an enhanced border enforcement zone which encompasses the entire United States. This is the wall’s 100-mile shadow even where there is no physical barricade. Some residents call this region a Constitution-free zone. It is the political equivalent of the frost-free bioregion Ajo enjoys. The latter fosters the growth of extraordinary flora; the former permits extra-legal practices that are, at best, constitutionally challenged. The military-style US Border Patrol checkpoints are a prime example. Nobody leaves Ajo without passing through one—no one. They can be an annoyance for caucasians, but a civil rights violation for people of color, nationality notwithstanding. There are also the home incursions that are unwarranted—literally and figuratively. The incidence of these invasions is markedly higher on the nearby Tohono O’odam Nation than in town. Several years ago, in one of the more dramatic incidents within Ajo proper, three men at prayer were wrested from their pew at the local Catholic Church and arrested just before Mass. In mid-January of this year two patients and a humanitarian aid worker were apprehended in a private clinic. Most of these incidents happen outside public view and are not deemed fit to print in our weekly paper, The Ajo Copper News. Residents south of the checkpoints live in a state of low-intensity occupation, a form of psychological warfare and a strategy designed to keep people subliminally on edge. Towers equipped with rotating cameras, ground sensors, helicopter fly-overs, and the dull hum of drones remind us that we are being watched—all of us. The escalating number of military personnel and the increase in unmarked government vehicles add to the specter of surveillance. For most people however, Ajo is, and has been, a place to pass through, or overwinter. The town is situated squarely in a region that has been an historic crossroad for indigenous peoples in a network that stretched from present day Mexico to Utah and from the Pacific coast to New Mexico. Now, as then, the year-round residents are a fraction of the number of those who pass through. Each winter our population more than doubles with the arrival of mostly retired, mostly northern US residents in their recreational vehicles or to their second home. Add to that figure the high volume of tourists we see every winter weekend bound for the beaches of Puerto Peñasco, in Sonora, Mexico. Migrant Death Map. Source: Humane Borders. Data development by John F. Chamblee, Michael Malone and Mathew Reynolds. With the ever expanding militarization of the US-Mexico border, we have also witnessed a veritable odyssey of people from the south traversing the harsh Sonoran desert terrain and walking through or around town. To one degree or another these passersby all experience “the shadow.” For northern tourists, it is a potential wrinkle in their vacation, like a long wait at the checkpoint. For our neighbors to the south, it’s another story entirely. The shadow, for many of them, is the shadow of death. Nearby Cabeza Prieta is the most lethal National Wildlife Refuge in the country, and neighboring Organ Pipe, the deadliest National Monument. 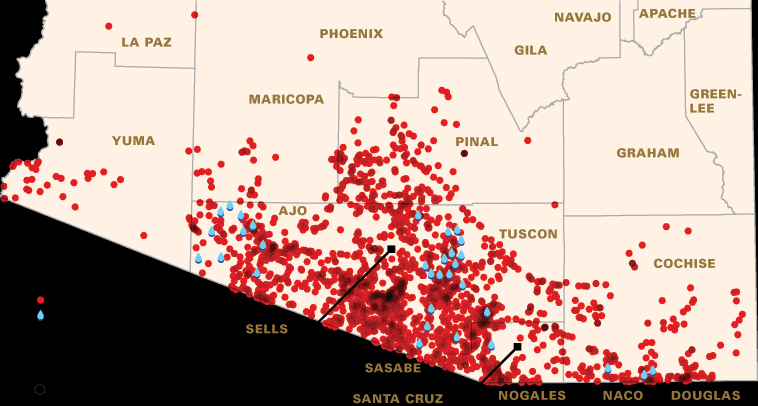 The number of recovered human remains on these federal lands accounts for a significant percentage of the overall fatalities in the entire Tucson Sector of the border. It is not uncommon for people crossing by night from the south, to slip past the public campsites of vacationing northerners at Organ Pipe. One seeking reunion, the other recreating together. Herein lies a slice of the pathos and paradox of life in the shadow. Every wall casts a shadow. Our nation’s immigration policies and enforcement have constructed hundreds of miles of border wall, and there’s a vigorous push for more. Take warning from those of us who live on the nation’s rim: the shadow is always longer, darker, and more insidious than the object that casts it—concrete, wrought iron, or racism. 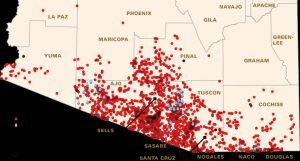 —John Heid works with the group No More Deaths in Ajo, Arizona. When I was 13 my mother announced to me: “I want you to meet your elderly Aunt Mary before she dies.” Without further discussion mother sent me off to Glassport, Penn. for a weekend visit. I’d never met Aunt Mary, and all I knew was that she didn’t speak a lick of English—and I no Polish. I was not fired up about spending the weekend with her. Following mother’s orders none the less, off I went on the Greyhound for three days that keep coming to mind every time the burning matter of immigration flares up. I fell into the rabbit hole of culture shock meeting the Ruthkowski side of my otherwise very German family. These folks were a passel of blood relatives who spoke differently, kept their homes differently, and cooked differently than in my house. And I had the time of my life, language barriers notwithstanding. We were family, tho’ culturally miles apart. Without saying a word of English, Aunt Mary opened windows in my mind, and widened, if just a bit, my view of what America looks like. Flash forward a couple decades to Baltimore in the mid ‘80s. I was serving 6 months in a federal halfway house on the far east side of the city. Every inmate was required to work outside the facility and I was granted permission to do my work hours as a volunteer at Viva House, the Catholic Worker several miles across town. Four days a week I would peddle across the city on my bicycle through neighborhoods I never knew existed, let alone been in. I recall hearing language after language flowing through the open windows into the sultry, summery streets of Baltimore as I passed by. And the fragrances coming from the kitchens linger in my taste buds. Each neighborhood unique. One city. Many cultures. Side by side. Every time I see somebody wearing a cap that reads “Make America Great Again” a tidal wave of questions arise. What is America? Who is American? Who am I looking at? Where am I looking? And when, if ever, was it great? When wasn’t it? The Earth has just gone full circle around the sun since the last US presidential election. I call 2017 the year of the looking glass, which culminates years of navel gazing. The deep rifts in the core values of our nation have been exposed. They are in our face. The comeuppance was inevitable. These differences didn’t happen overnight, any more than earthquakes do. The tectonic plates of sociological structures move slowly, often imperceptibly. Voices at the edge have been warning us for decades—even longer, from the beginning. Our history celebrates and haunts us; mostly from the closet. Now we’re face to face with ourselves. The emperor’s clothes lie scattered on the ground, alongside ours. And our national wounds are exposed to the light of day. A worthy remedial education course could begin with Ms. Dunbar-Ortiz’s Indigenous Peoples’ History, Michael Bronski’s A Queer History of the United States, Kim E. Nielsen’s A Disability History of the United States. Not to mention Howard Zinn’s masterpiece A People’s History of the United States. Re-membering is, after all, simply putting together the myriad stories of all those who inhabit this land thereby exposing and breaking through the cycle of cultural amnesia. Where do we go from here? There are no quick fixes. No one-size-fits-all legislation. A change in Administrations in and of itself does not interrupt the status quo of colonization and its subsequent repression. Revolution? Isn’t that what got us here in the first place? Perhaps, what is needed is a revolution of heart, as Dorothy Day, co-founder of the Catholic Worker said. On my first trek across the Growler Valley in the Cabeza Prieta National Wildlife Refuge some years back, I was smitten to the core. A stillness I have rarely known settled within me even as a bone dry wind piqued my sensibilities. Mountains rim the horizon of this seamless plain in every direction. Few trees or rock formations interrupt the valley floor. The world is half earth, half sky—no in between. Time collapses in the Growler. Only the sun seems to move, and slowly at that. While this valley’s horizons are well defined, they are distant and illusory. Like an outgoing tide, they recede as you approach them. Never before have I experienced this sort of motionlessness. As if I was walking in place, all day. Austerity understates the character of this Sonoran desert expanse. Herein lies the Growler’s wonder, and paradox. Its plainness is a ruse. An unassuming landscape disguises both power and fragility, innocence and danger. While vast, the valley offers scant water and no shelter, save the many burrows where all sorts of small lizard and mammal reside. Most are nocturnal. Conditions are harsh in summer and not much kinder in winter. Her stories are hidden in plain sight. Petroglyphs and murmurs in the wind offer hints that there is more to what you see than you can imagine. Sometimes I have heard whispers in the zephyrs in languages I do not recognize. And I ponder. Who has walked here before? Who scribed the rocks? And why? Mardy Murie, grandmother of the conservation movement, encouraged people to know their places of enchantment. To cherish them. To protect them. The Growler Valley is one of those places for me. Edward Abby too was drawn to this valley. In life. And in death. It is here that he was clandestinely buried in 1989. His undisclosed grave site is reportedly marked by a simple head stone that reads: “Edward Paul Abbey, 1927-1989 No Comment.” Ed is not alone out there. Not anymore, if he ever was. The others simply don’t have grave stones, let alone identities. These unknown ones are part of the growing number of desert fatalities which I wrote about earlier this year. (Spring 2017 issue of the Nukewatch Quarterly.) The marked increase in the number of bodies recovered in the desert in the months between writings compels me to revisit this crisis from a more personal perspective. I cannot get these disappeared ones off my mind, or heart. One-hundred and thirty-one sets of human remains have been recovered in the Tucson Sector of the US-Mexico border this year, dozens in the Growler Valley alone. One cartographer calls this route “the trail of death.” Cabeza Prieta which boasts “one of the most biologically diverse deserts in the country” in its brochure is our deadliest National Wildlife Refuge. It’s grandest valley, the Growler, has become a veritable cemetery of the unknown. This is neither an accident nor a miscalculation. It is a premeditated crime against humanity and nature. Immigration and Naturalization Service personnel predicted fatalities decades ago when they proclaimed the desert as their “ally.” Militarization and enforcement plans have intentionally funneled people into some of the harshest terrain on the continent. These policies have taken countless lives and irreparably torn up the desert’s fragile cryptobiotic soil crust. Border Patrol 4-wheelers have cut hundreds of miles of unauthorized roads on land ostensibly protected by the Wilderness Act. 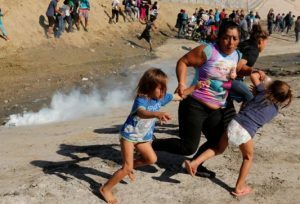 US border policy has turned the region into a weapon and desecrated it. The desert is not to blame for these deaths. For its part, the Sonoran has done the best it can with the bodies forced upon the rugged terrain. Celestial and terrestrial burials involve vultures, coyotes, and bone-bleaching heat. It is human policy, not Mother Earth, that is culpable, if not indictable, for what is happening here. The desert is no ally of any government. In a recent administrative change, Refuge personnel revised the annual land use permit. As of July 1, 2017, it is illegal to distribute humanitarian aid sup- plies on Cabeza Prieta. While the Refuge brochure emphasizes the need to carry water, the revised permit prohibits the supplying of water. Many in the humanitarian aid community have strenuously criticized this change in policy, just as we have denounced the border enforcement policies which have pushed people into isolated terrain in the first place. We grieve and decry the calculated loss of life and the lethal implications of this procedural change. As I hustle this article to meet a publication deadline, aid workers are preparing to hand-carry gallons of water to the Trail of Death and other refuge sites. Access to potable water is a human right. We intend to make water available to anyone in need, no exceptions. Humanitarian aid is never a crime. Not now. Not ever. — John Heid is a humanitarian aid worker with No More Deaths and Humane Borders. He lives in Ajo, Arizona 40 miles from the US-Mexico border.